HOUSTON - All the destruction. It's remarkable to think that Harvey impacted the area nearly one year ago. A taxing chapter for millions in our city and region that will never evaporate from the psyche of many. Vladamir Naranjo is one of them, "The initial impact was just devastating." Naranjo is still fighting for fresh air even as one can smell the mold in what used to be his office building. After absorbing several feet of floodwater from nearby White Oak Bayou, Naranjo thought rebuilding would be simple considering he owns a construction firm. In reality, it has been much different, "It's been a lot more complicated than I imagined." Things are about to get even more complex for flood victims. FEMA has imposed a deadline to file a proof of loss claim. That deadline is one year after the date of loss. For most that is coming at the end of August. However, when it comes to Harvey FEMA has made it clear there will not be an extension. Marlowe is a Houston-based attorney experienced in disaster claims. She also represents Naranjo. Marlowe, who worked in New Jersey and New York in the aftermath of Sandy believes FEMA's motivation for not extending the deadline boils down to one thing, "It has something to do with money." In fact, FEMA sent a June letter to Marlowe's firm where they stated an extension would be "unnecessary and not helpful to policyholders.” The agency claims 99 percent of claims from Harvey have been closed. However, Channel 2 Investigates uncovered that after flooding in Louisiana, FEMA granted an extension even though the closure rate was better than Harvey at 99.6 percent. "I'm not sure that 99 percent is a truly accurate account, but even if it was, when you think about that 1 percent you can still be talking about tens of thousands of people," Marlowe said. After Harvey, cleanup was just the beginning. Filing an insurance claim became a lengthy and complex ordeal for many flood victims. Naranjo says one adjuster would not get back to him, dragging out the claim process for months, "They cannot hold people who got affected by the flood hostage because of a deadline that somebody imposed. That is not acceptable." Channel 2 Investigates took the findings of our investigation to Houston-area Reps. Gene Green and John Culberson. When informed FEMA’s reasoning for past storms does not match up with Harvey victims Cublerson said, “Right and FEMA needs to understand you can't leave any flood victim behind." When asked for his thoughts on what Channel 2 Investigates has uncovered, Green said, "Well, strikes me that FEMA has a different playbook with Texas than they do with Louisiana, New Jersey and New York and that's just not acceptable." Culberson is a senior member of the House Appropriations Committee -- the committee that is responsible for funding the federal government. "It is important that FEMA remembers who pays their bills,” he said during our interview. The representative also stated, "When it comes to rebuilding, there is no expiration date." FEMA did provide a year-long extension in the immediate days following Sandy in November 2012. The agency ultimately extended the window to Oct. 29, 2014. 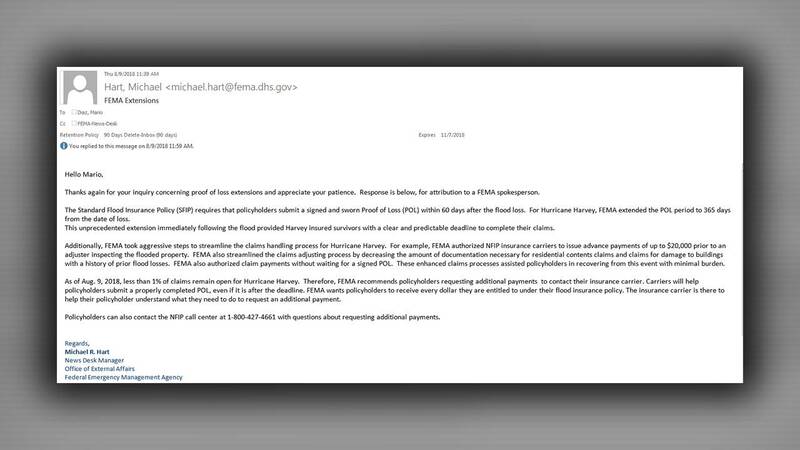 In response to Channel 2’ Investigation Culberson and Green sent a bipartisan letter to FEMA’s administrator Brock Long on Thursday afternoon requesting for an additional six-month extension.